Definition: 95th Percentile Measurement is used to determine the volume of traffic exchanged for the transit fee (or paid peering) calculation. Every five minutes the meter on the service is sampled. The delta is calculated between the two adjacent samples and stored. It is in the step that corrections are made for wrapping counters, counter resets from reboots, etc. At the end of the month, the five-minute-deltas are stacked lowest to highest and the 95th percentile measure is used to calculate the traffic volume for the month. 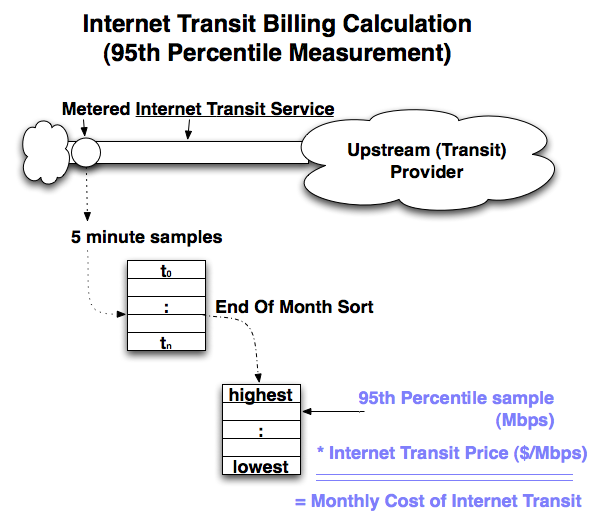 Monthly 5 minute samples are collected and sorted lowest to highest, using the 95th percentile measure to calculate the monthly Internet Transit bill. This method allows customers to burst above the 95th percentile measure and not have to pay for that supposedly anomalous traffic. Some of the more clever (some would say seedier) ISPs have gamed this system by sending up to 36 hours of burst traffic and then close to zero traffic for over 95 percent of the time, allowing them to use the transit service at minimal cost.